One of the areas that I have struggled the most with in finding curriculum that really works for the kids is in math. This year we have students doing Algebra I, Algebra II, Math 5, and Math 3. It would seem that with four children we should just be able to buy one curriculum and keep passing it down. Our family’s experience is that that works for many things, but when it comes to math it is just not worth the battle. Learning styles, academic struggles, and giftedness seem to all get magnified about tenfold in the area of mathematics. So here is what we have decided on for this year. Our oldest and youngest are both using Saxon. We have enjoyed the Saxon curriculum as a family. The kids learn a very self-directed approach to learning. There is lots of basic fact practice in the earlier years. Each of the levels in the Saxon Math Curriculum presents a new concept per lesson as well as a mixed practice set of problems to be done daily. The mixed practice is a constant review of all math concepts covered throughout the year. A little bit different approach to the math that I grew up with is the scattering of math topics covered. Rather than having a whole chapter on multiplication, then a complete chapter on long division, and one followed by a geometry chapter, the Saxon curriculum intermingles math concepts throughout the book with no chapter delineations. We have supplemented our daughter’s use of the Algebra II book with the use of the DIVE CD that corresponds with this curriculum. The DIVE CD is the equivalent to a “Teacher in a Box“. There is a lesson on the dvd for each lesson in the Saxon book. The teacher demonstrates how to do the problems step by step. This allows our daughter to still work independently, but to also have a resource to help walk her through the problems. It is also a great resource for me when she still is struggling and needs help. We can go back through the DIVE lesson together allowing me to get a better handle on the material that she has questions on. 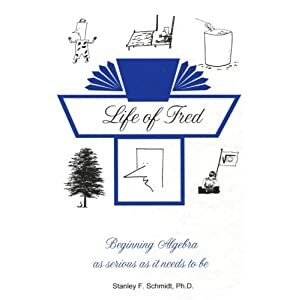 The Life of Fred Series is a very different approach to the learning of math concepts. It is the telling of the life story of Fred, a 6 year old math genius that teaches at Kittens University. The escapades that Fred finds himself develop the backdrop for the presentation of Algebraic concepts that are covered in other beginning Algebra curriculum. This unique approach to math allows all of the concepts presented to be within a contextual framework. Every problem is a word problem that gives significance to all those x’s, y’s, and q’s. The student not only solves the problems, but also decodes the word problem to become an expert in equation writing and application. The Home Companion guide that can be purchased with the Beginning Algebra book provides a complete answer key to all the problems and also breaks the Beginning Algebra book into manageable daily assignments. Using the Life of Fred math series is the Great Homeschool Experiment of 2012 for the Oaks family. 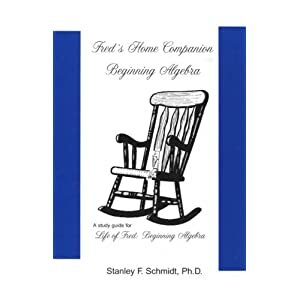 Many recommend this curriculum as a supplement to more conventional courses. We have chosen to use it as our core text. If we can joyfully master the concepts presented, learn to properly decide on what type of problem is being presented within the word problem and set up the appropriate equation, and grab a mastery of this material, we will come out on top. For our second oldest, just plugging along in a vague understanding of the material and constantly wondering how this applies to real life is no longer enough. We might not cover all of the same math concepts in more traditional Algebra I texts, but if she can apply the concepts presented and be confident in what she has learned, it truly will be a victory in our home. 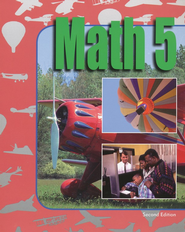 Our third child is using Math 5 published by Bob Jones University Press. BJU Press is definitely considered among the more mainstream curriculum. It varies from Saxon in that it presents the material in chapters based on the math concept. Multi-digit division may be covered in Chapter 5 with Geometric Shapes and Properties being covered in Chapter 6. All of the concepts and problems in a given chapter relate to the topic of the chapter. There is review of the concepts from previous chapters in the Cumulative Review section at the end of each chapter. For our son, it is not just the repetitive reinforcement of the math concepts with approximately 30 problems per lesson that is the appeal, but also the format of the text. The pages are colorful. The use of color is huge for our son who is a right brain learner with some split dominance issues. For more information on these learning challenges, I greatly recommend that you check out the writings of Dianne Craft at her website here. After seven years of homeschooling experience, I can truly say that the use of the right math curriculum for each child can be the “make it or break it” to feeling like you have had a joy-filled year. I am not always a proponent of using curriculum just because your child likes it. However, maintaining a healthy, respectful relationship is much more important to our home than wearing the badge of Math Police any day. Using individualized math curriculum for our children allows them to develop their math skills as God already wired their brains to work the best. How can you go wrong with that!!! 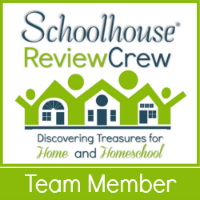 Lisa, it really is amazing to see what options are out there for homeschoolers. Much different than a lot of the materials we used in public school 30 years ago. Congratulations on the migration to Math specialist from the world of science. I have thought of you often as our oldest is working on Chemistry this year. I hope life is treating you all well. Next post: Tuna for Breakfast??? ?